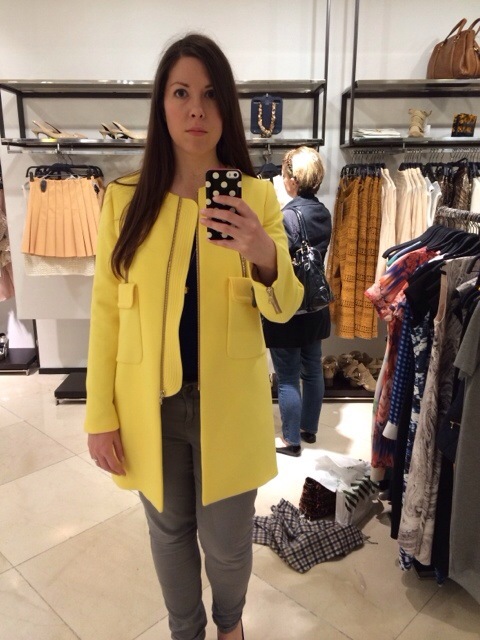 Channeling two of this season’s hottest trends is this delicious lemon yellow coat from Zara, which caught my eye today! The collarless coat is hot shape for this season, and it’s one that I’m just starting to warm to at the moment. It’s a classic shape that has yet to make its appearance in my wardrobe, but I’m more than happy to make the plunge now I’ve realise how flattering and feminine it can be. And in this beautiful colour, it’s even more on trend – check out the Pantone colour report for Spring 2014 here. I have to say I’ve never described a colour as being ‘freesia’, but I’m definitely going to start now! So what do you think of the collarless coat trend? Is it a yay or a nay?